!F Lab will not happen this year. The training programme that I started in 2015 with the collaboration of innovation agency iDrops, the creative help of Mike Robbins and the financial support of Creative Europe, has not obtained the necessary EU funding to continue its activity. This is partially due to the fact that we had proposed to transform it into an accelerator programme – claiming that training initiatives are not enough in the current digital industry, and that direct public investment is more necessary than ever in shaping our future digital landscape. Whatever are the reasons for which we have not been re-selected by Creative Europe, I must assume that they have not taken the satisfaction of our participants in the equation. In four years of activity we never had a seriously negative feed-back and, if anything, we keep being invited to different countries by ex-participants that want to convince their peers about the importance of co-creation and user centred design practices in the conception of digital experiences. This makes me think that the work we have done during the past four years will not disappear in vain and, if anything, it will keep being iterated by people from different cultural backgrounds and socio-economic realities. In a way, this has always been the reason for creating a new ideation methodology: to have the luxury of experimenting and testing our ideas and then release our results to a wider public hoping that it would be used, shared and ultimately adapted to their needs. 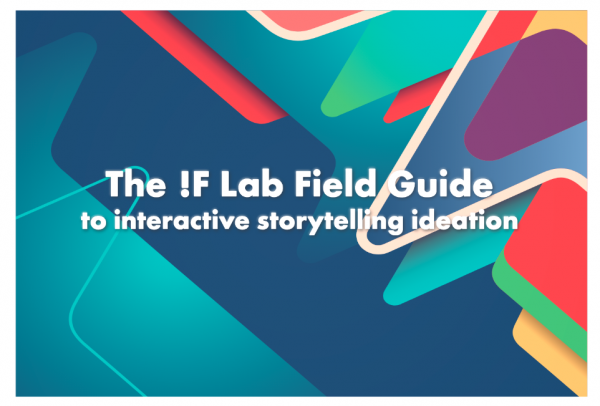 With this is mind, we have recently published the free, and ready to download for personal and teaching purposes, !F Lab Field Guide to interactive storytelling ideation – a simplified version of the process we would follow during ten days of !F Lab workshop. I have recently used this short version of our methodology when invited by Dominique Santana, ex-!Flabber and doctoral researcher at the Luxembourg Centre for Contemporary and Digital History (C²DH), to inspire historians to use digital storytelling to “make history”, disseminate research and involve students in more networked and associative ways. 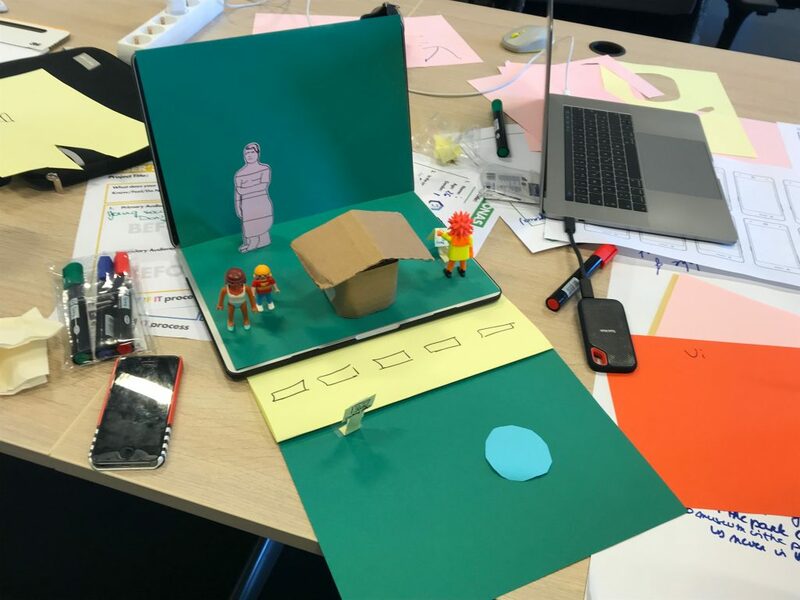 The richness of results and prototypes that were created after just one day of workshop consolidated my intuition that simple hands-on activities and paper prototypes are a great way to unblock most techno-sceptics and preach the importance of multi-disciplinary collaborative teams. 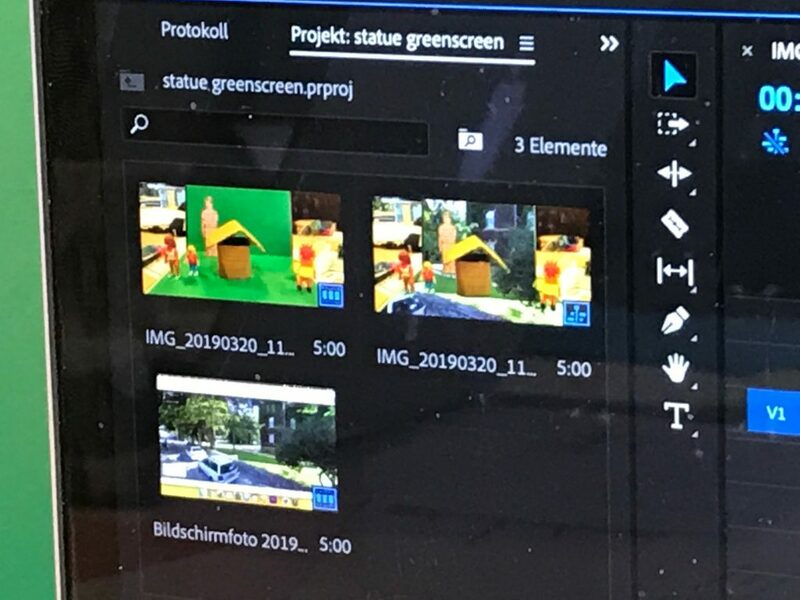 As part of the dissemination of the !F Lab methodology, I also started last year a collaboration with Dr Andre Paz, professor at the Federal University of Rio de Janeiro State (UNIRIO) and coordinator of Bug404, a Brazilian digital platform about interactive narratives. Thanks to the British Academy Newton Fund scheme, Dr Paz participated to all of !F Labs workshops, interviewed our participants and experimented the WHAT IF IT process for himself. 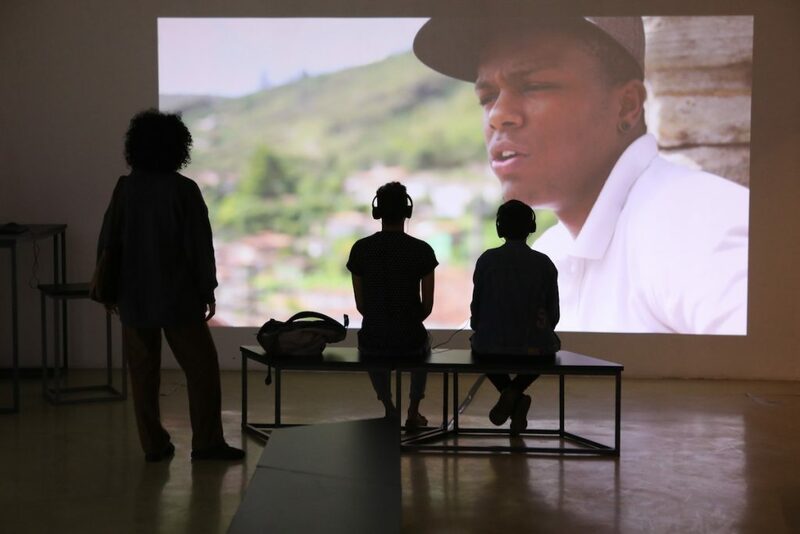 We then used the data he collected to research together a way to adapt our methodology to the different needs of the Brazilian cultural economy. 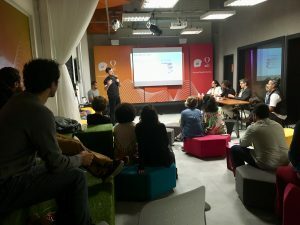 Still thanks to the British Academy’s support, I had the opportunity to go to Rio de Janeiro in September 2018 and test a different iteration of our methodology through four days of what we called “IF BUG LAB” – a mix between the !F Lab and BUG404 initiatives. The timing of our intervention had been carefully planned to coincide with the BUG Exhibition, held in the Oi Futuro Flamengo Cultural Centre in Rio de Janeiro, between September 11th to October 9th 2018, and curated by Dr André Paz, Dr Julia Salles, and Dr Arnau Gifreu-Castells. 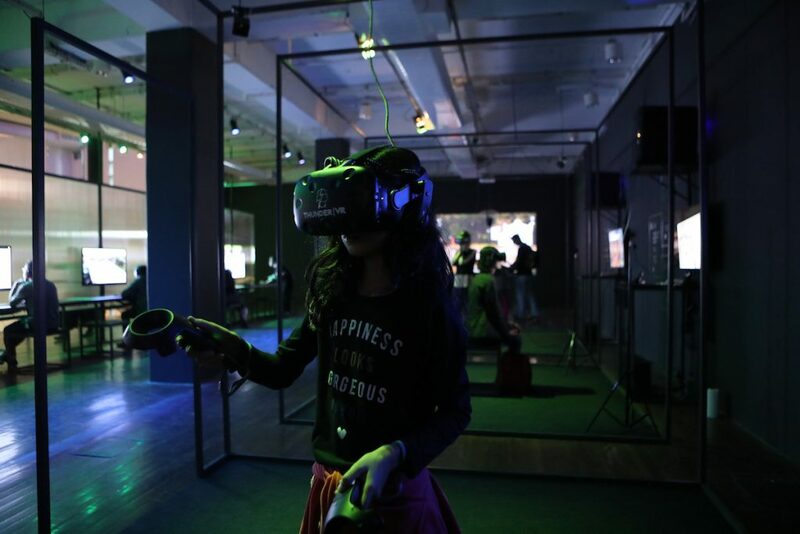 This massive retrospective exhibition of interactive factual narratives covered three entire floors of the Oi Futuro Cultural Centre and generated a real buzz within Brazilian’s audiovisual and cultural industries. It is within this context of excitement for interactive and immersive narratives that Dr Paz invited seven projects to join us for four days of ideation workshop. 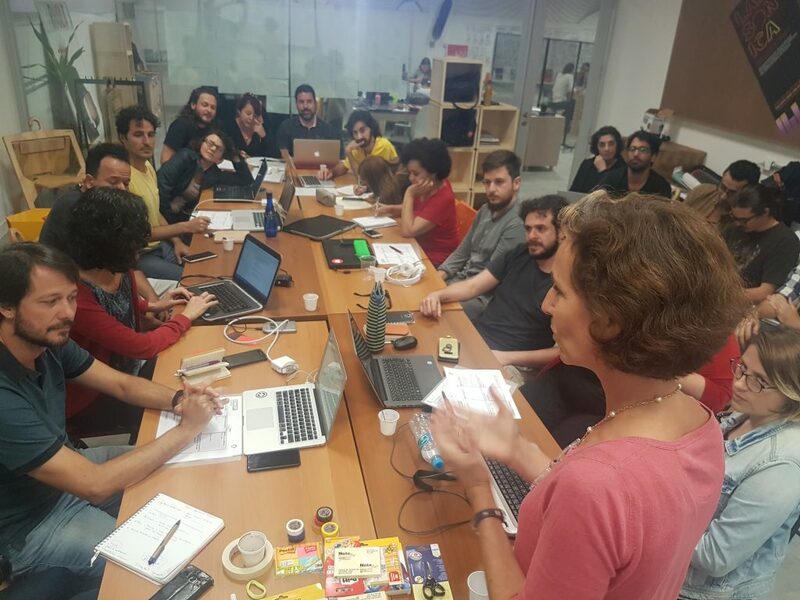 Our decision was to change our methodology to be less of a “think big, adapt later” approach and to be more “resource focused” in order to take on board the relative lack of finance opportunities for digital narratives in Brazil. The full description of our findings is soon to be disclosed in an article that I have co-written with Dr Paz. The collaboration with the Bug Exhibition and British Academy also allowed us to co-edit a book BUG: interactive and immersive narratives (forthcoming), that will be published in Portuguese and English, and that will serve as a base for newcomers to interactive and immersive narratives. Acting as a catalogue of interactive projects, filled with interviews and articles from scholars and practitioners and sharing production and methodology tips, this free book is once more an attempt to disseminate knowledge in the hope of increasing the quality and production of meaningful and transformative interactive narratives. My deepest belief is that public money well spent is money that supports experimentation that the industry cannot afford because of its short terms production cycles, or endemic short sightedness. Doubting, changing, exploring and testing ideas does take time, but it pays off in the long term. I hope that the extended life of !F Lab – through the methodology dissemination, the articles and books that we have been writing and the new iterations proposed by new partners – is just at its beginning. I invite you all, students, scholars, producers and practitioners to keep the research and experimentation active. I’d love to try more co-authoring approaches, to add more experience design aspects and extend the research toward an ethical model of collaborative interaction ideation. Reach out for new initiatives, use what has been published, re-mix and share again! Creative Europe is the European Commission’s programme for the support to the culture and audiovisual sectors. Its 1.46 Euros billion fund is redistributed toward initiatives that support Europe’s cultural and creative sector. More at https://ec.europa.eu/programmes/creative-europe/about_en.